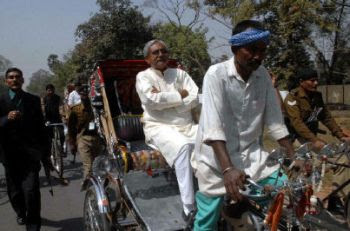 Nitish’s day out: Bihar Chief Minister Nitish Kumar goes in a cyclerickshaw to a theatre to watch the Oscar-winner Slumdog Millionaire in Patna on Thursday. His three-kilometre journey was “to relate to the common man” who was the focus of the film. It also revived memories of his college days when he used to travel in this manner for watching movies.